Ooh, the Xootie is lookin muy caliente with this Glamour Shots photo filter! Hola Bike Commuters! The Xootr Swift and me, (or as I refer to him as the “Xootie” because it rhymes with “cootie”) and I go way back: to August of 2011! 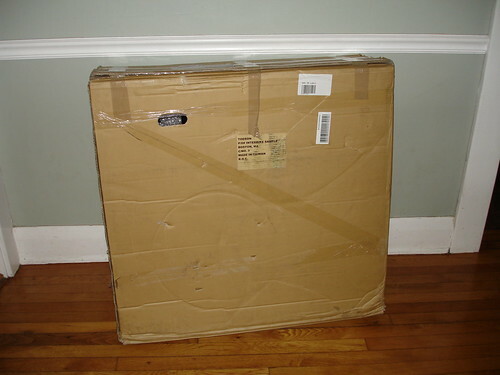 Xootie arrived at my sister’s place in L.A. by ground shipping in a shorter than average cardboard companion. Just in time to liberate me from the four-wheeled nonsense of my vehicluar-obsessed family in L.A. Digression: Last year, they insisted that they drive me seven blocks from Grandma’s house in Santa Monica to Auntie’s house in Santa Monica. 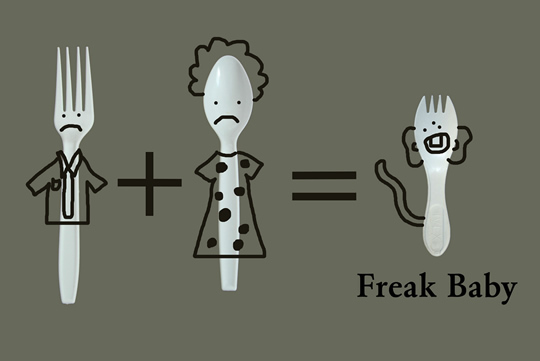 I took my jugular hostage with a plastic Taco Bell spork in order to escape a 3-minute trip in an oversized SUV driven by my crazy half blind aunt and took off on the Xootie. Nearly all parts are industry standard…no weird and incompatible stuff. Ready to go out of the box. We’ve made the hard choices for you. Available as either an 8 speed or single speed (black only)Note:Single speed version is sold out. Due to lack of photo-taking skills, I had to edit in pink. Handlebars and seat height real close to the road bike set up. Also, in as well as, in addition to, the Xootr Swift folding bike proved a worthy travel companion, as I have stuffed him into everything except the overhead compartment for carry-ons: the back of a Toyota Corolla trunk, large rolly wheeled suitcases, under the tables at a booth in a craft fair, the back of an eight-passenger State vehicle, tiny apartment elevators, and a dingo. 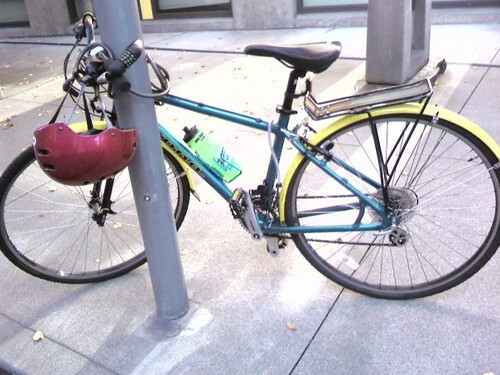 The trick with this folder is that the seat post acts as the locking mechanism for the bike, making it as easy to collapse as fainting baby goats. The handle bars also have a quick release pin making the bike even midgier for the back of my co-worker’s Subaru. No need to fold down the seats with this spectacular Xootie nugget! The Xootie Swift has been tons of fun around town! I’ve used it for every commute day and even lent it to a visiting friend (who complainted of taintal discomfort, but I blame that more on a weak sack than the engineering of the bike). 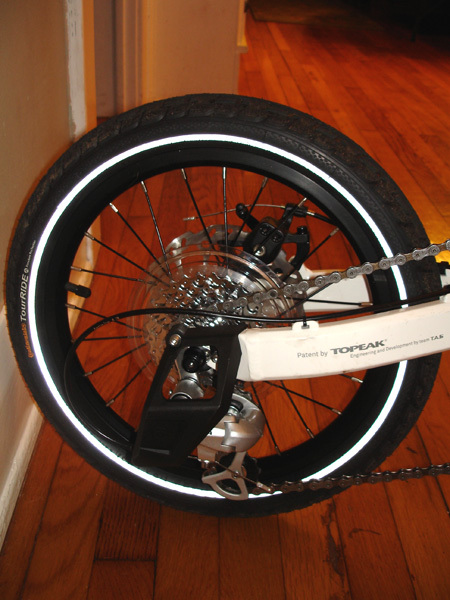 With it’s BMX-sized “bulletproof” wheels, it is a whippy mo-fo. I’ve casually bunny hopped some spam musubis and quickly detoured from road to sidewalk to bike path in order to avoid traffic congestion during rush hour. With the 8-speeds it’s golden for cruising on errands or commutes up to 12 miles and taking Diamondhead uphill! 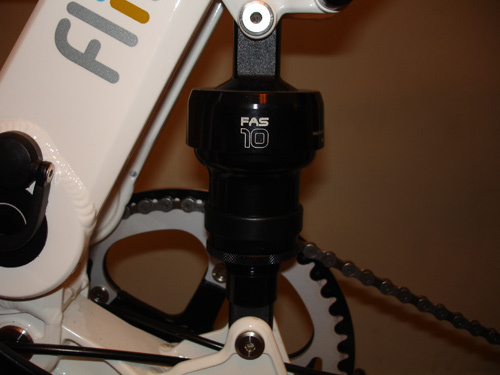 Hook me up with an easy gear ratio any day: I’ve got nothing to prove! Curbs or Spam musubis, nothing stands in the way of Xootie Swift's BMX wheels. I have had all kinds of comments shouted to me in downtown while waiting at lights or turning corners, “Nice blue on your bike” or “Cute, your bike!” or “Fancy bike, where’d you get dat?” Confessional Digression: I have grown fond of the Xootie, but due to it’s small size I felt like a clown on the way to a kid’s brthday party at Chuck-E-Cheese the first couple of weeks. I have always wanted to commute on a folding bike but never had a small enough apartment that it didn’t make sense to get the big kid wheels for the same price. I’d been eyeballing origami cheap $200 single speed or 3-speed suckers since the original purchase of the Kona Dew back in 2007. Claiming no technical expertise on the subject of bikes but lightyears of experience in good old-fashioned bikey fun, I was won over by the Xootie as it’s a mini-wheels are nostalgic of childhood, and it’s a very practical commuter choice. Oh, the SHAME. It’s like hanging out with my dorky little brother who is actually a lot of fun and more like me than I’d like to admit. Spark Notes: The Xootr Swift comes in S,M,L and XL sizes, and looks more like a scooter than a bike. Surprisingly, it’s a quick commuter considering the size of the wheels. Eight speeds makes tackling hills a no brainer! Three months of commuting through Chinatown, with it’s streets shimmering with crushed glass vials, and no flats is a good sign for the stock tires! I give it five thumbs up for portability, easy to fold, assemble, and carry, flashy blue color, and whippy maneuverability like Willow Smith. I give it one big toe down for initial dork factor of riding a bike that looks like a scooter, and grip-shifters (yucky to fix when they get stuck!). If you like rooting for the underdog, go for the Xootr Swift! 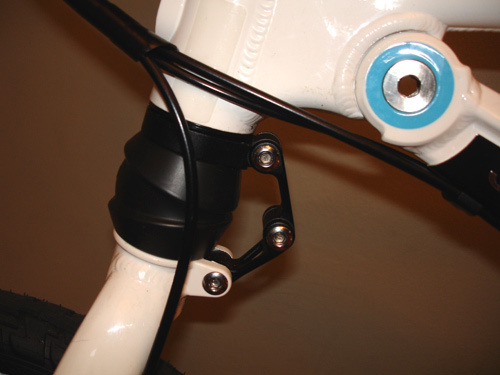 For a more tech-savvy review, check out this one from Velo Bike Parts in October 2011. Xootie in the sky with diamonds. Remember that oddly-shaped bicycle box that came on “Brown Santa” last week? 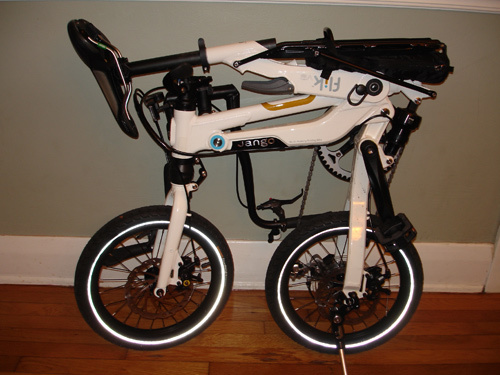 Well, some of our guessers were right: it IS a folding bicycle. A Jango Flik V9, to be exact. Released in Asia and revealed to great interest at both Eurobike and Interbike 2009, the Jango Flik is a new player on the folding-bike scene. We’re lucky to have gotten a sample to test for a few weeks before it gets sent back to parent company Topeak, and I wanted to give you a look at some of the major features before we get down to testing it. Maximum Rider Weight: 110 kg/ 242.5 lb. 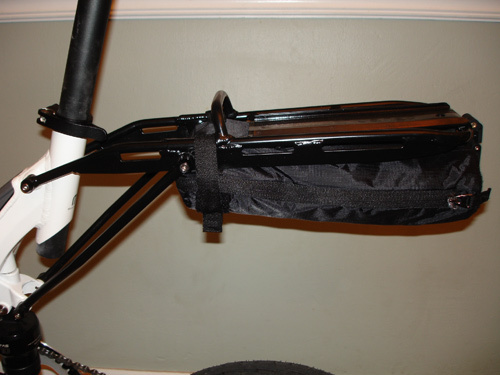 You’ll notice that the integrated kickstand swivels to allow the bike to stand in “shuttle” mode. That’s a nice feature! As part of my review I will include a video or two of just how quick it is to fold this bike in both modes. It couldn’t be easier, and Jango has put a lot of thought and time into creating a system that makes folding effortless for the user. 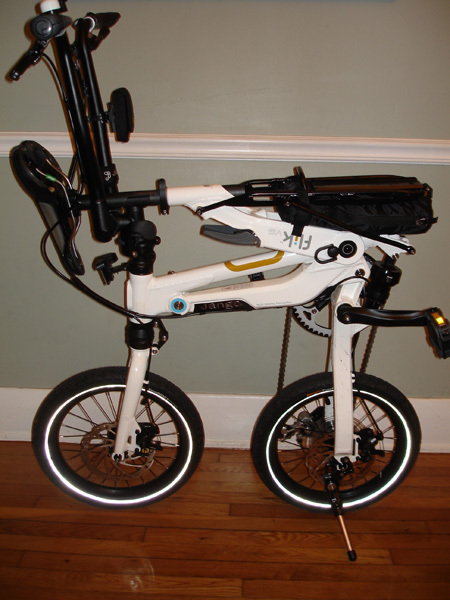 I will also compare this folder to a more “traditional” folding bike, both in terms of folding ease and final folded size. I haven’t had a lot of experience with folding bikes — many of the people who know me and my cycling habits know that I’ve been clamoring to fill a gap in my bicycle fleet. Here’s why: although I’m not a multi-modal commuter, there are days when it’s time to go to work and it’s pouring down rain. With the vagaries of Florida’s weather, it is almost invariably sunny and dry within a few hours and after I’ve “chickened out” by having my wife drive me to work, I wish that I had a folding bike on hand to make the return leg rather than wait to be picked up. A folding bike would be awfully handy for such a scenario, as it would be for someone who does part of their morning commute via carpool, bus or train. 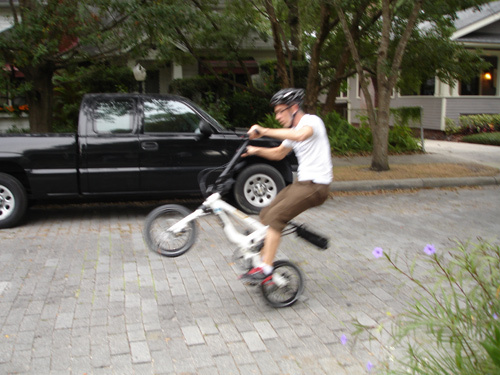 Besides, in the brief experiences I’ve had with folding bikes, I’ve learned that they are FUN to ride. Sure, they look weird, but once I get on something happens and I realize I’m wearing a huge grin. 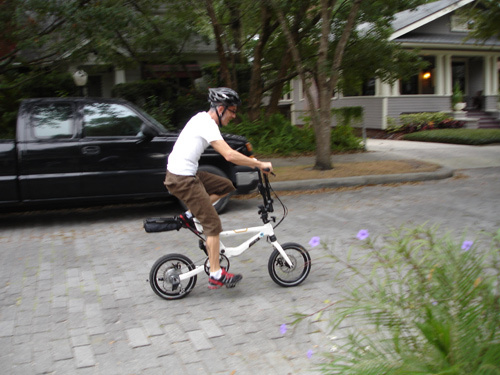 I’ll be testing this bike in the urban conditions in and around Tampa — navigating the urban corridors and otherwise using the bike the way Jango intends it: as a handy, portable travel solution for city-dwellers. Stay tuned and in a few weeks we’ll have the full review.